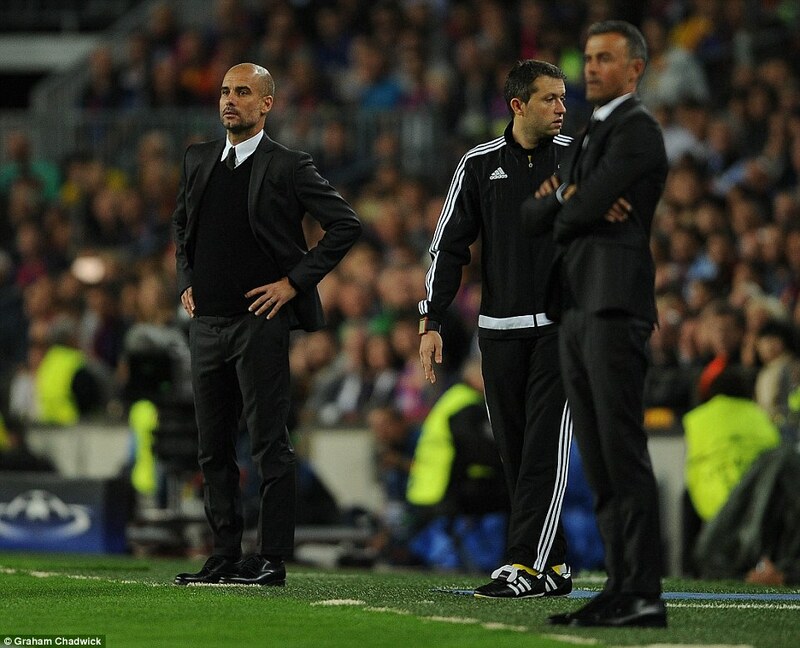 Guardiola had said he would ask his team to match Barcelona for possession. It was ambitious but for a short while it worked. Early in the game, the right-hand side looked as though it might be productive for City. On a couple of occasions, Raheem Sterling ran into just enough space to deliver a cross, while a move down the other flank in the ninth minute saw David Silva and Kevin De Bruyne combine to find Nolito in the penalty area. Briefly, the Spaniard had a little space but he couldn’t use it to engineer a shot at goal. 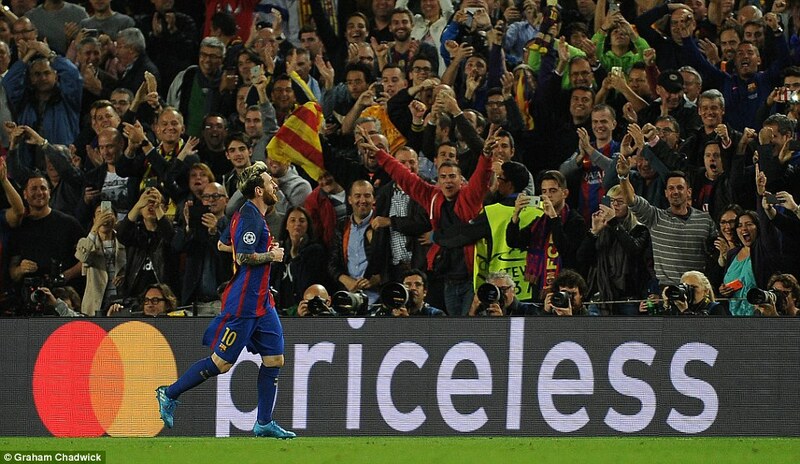 Messi had endured a poor start but nobody was surprised to see him spring to life to nudge Barcelona in front. He began the move down the right, inviting a couple of reckless challenges, yet there seemed little danger as he scuttled into the box to seek a return pass from Andres Iniesta. 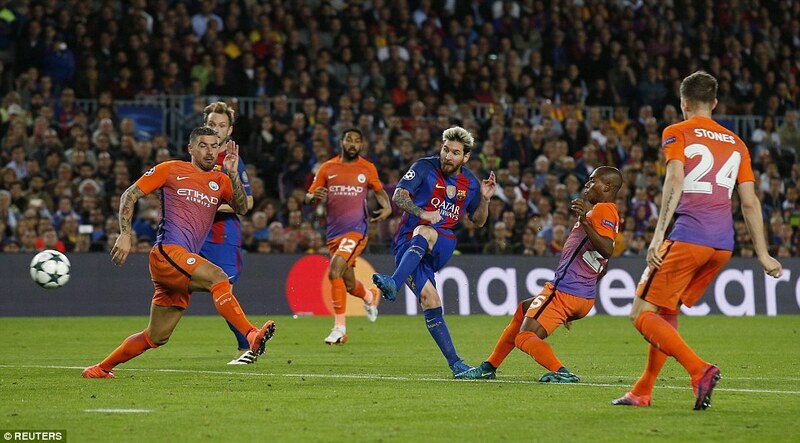 But when the ball bounced loose from Pablo Zabaleta’s challenge, Fernandinho slipped over on the slick turf, Nicolas Otamendi was caught on his heels and Messi picked up possession, rounded Bravo and scored. 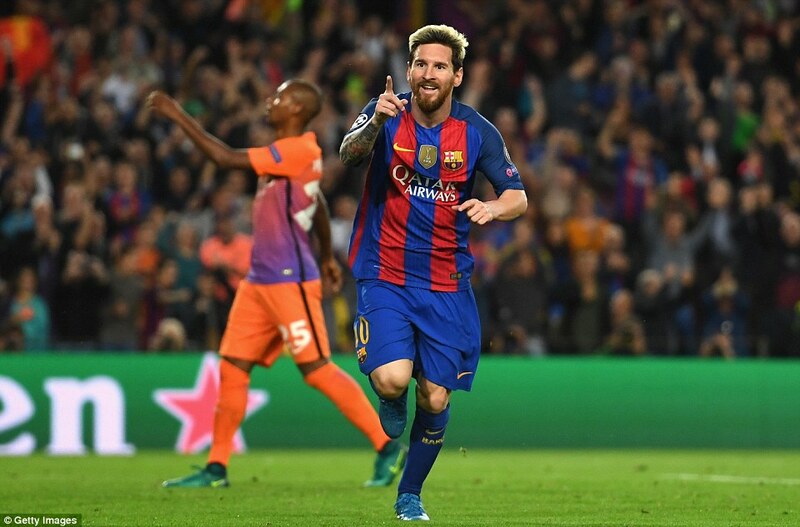 Encouraged by the goal, Barcelona’s dangerous players came to life and City struggled to cope as Luis Suarez and Neymar began to create angles with Messi and Iniesta. 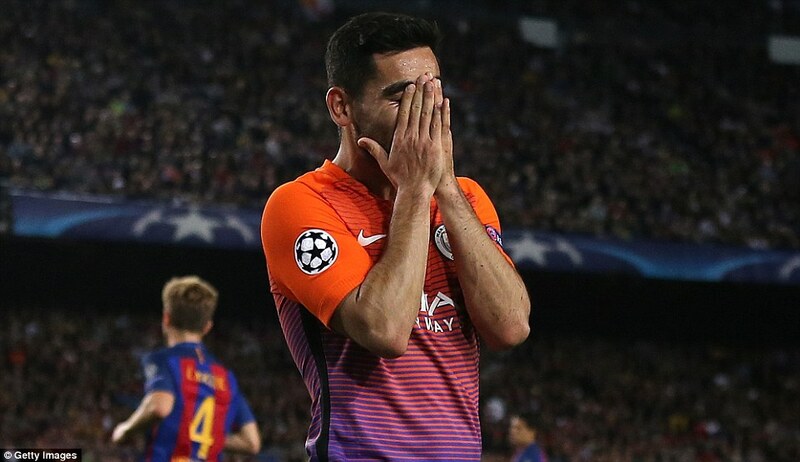 Suarez struck the side netting in the 21st minute after Messi confused Fernandinho and Ilkay Gundogan before Bravo dashed recklessly from goal to deny a breaking Neymar by a matter of inches. 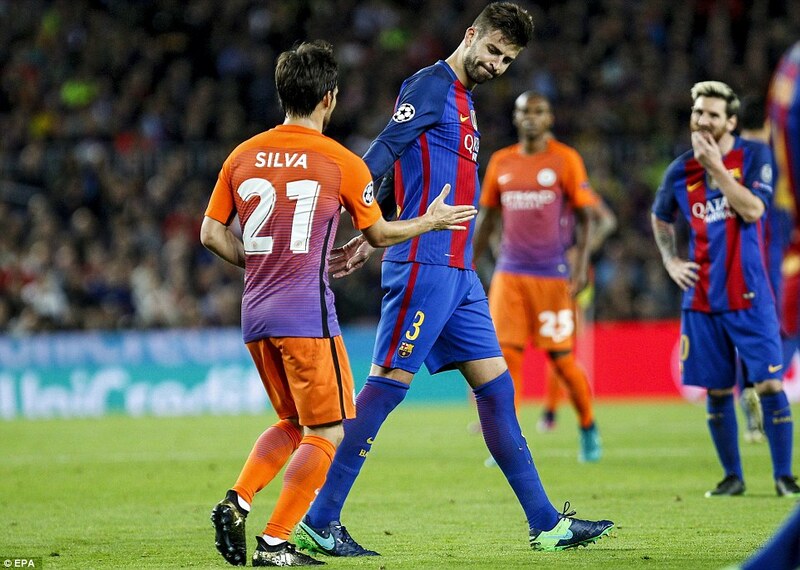 Barcelona had already lost Jordi Alba to injury early on and as half-time neared they lost another defender, Gerard Pique. 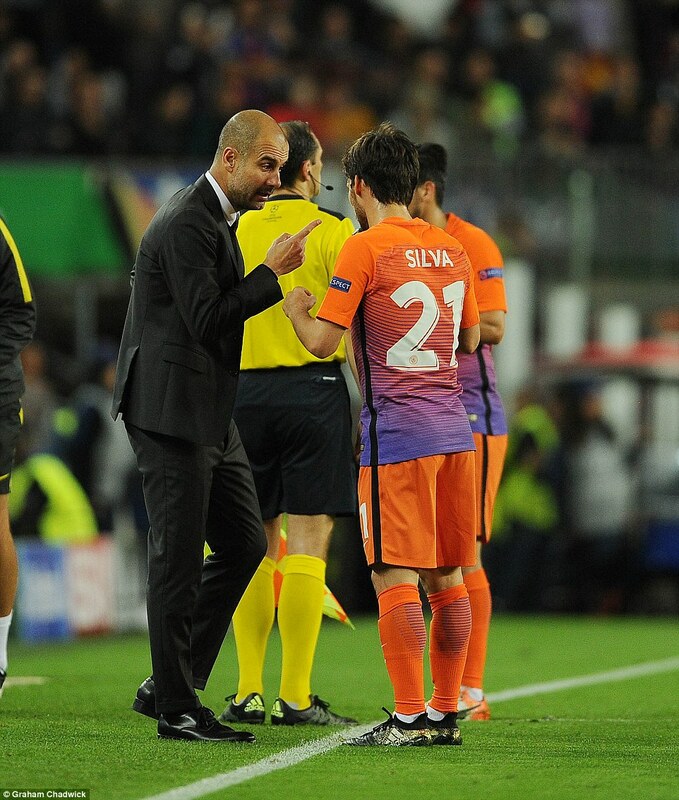 City, meanwhile, began to find a way back and twice could have equalised. Gundogan was a busy presence in the City midfield and his skilful run and shot appeared to have brought an equaliser, only for Marc-Andre ter Stegen to intervene with his left hand. Then John Stones headed a free-kick wide when unmarked. City suddenly looked refreshed. 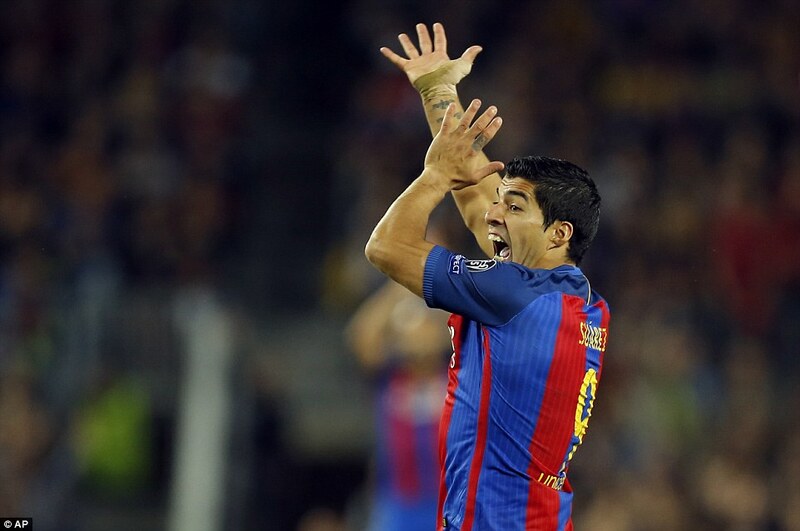 Having said that, Barcelona almost punished a defensive lapse in the 45th minute as Suarez burst through. Bravo stuck out his left leg to deny him and then reacted well to jump up and touch the loose ball over the bar. 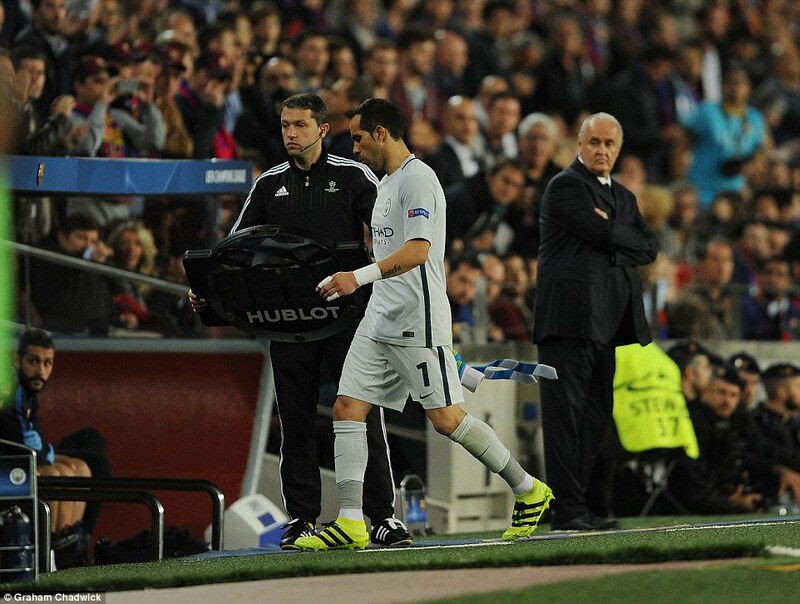 Aguero did appear at the start of the second half but only to warm up on the touchline. Meanwhile, City showed more promise as De Bruyne twice reached the byline to provide dangerous crosses. This continued be an odd night and the most oddest was yet to come. Samuel Umtiti headed a corner wide when unmarked in the 51st minute before Bravo’s aberration a couple of minutes later. 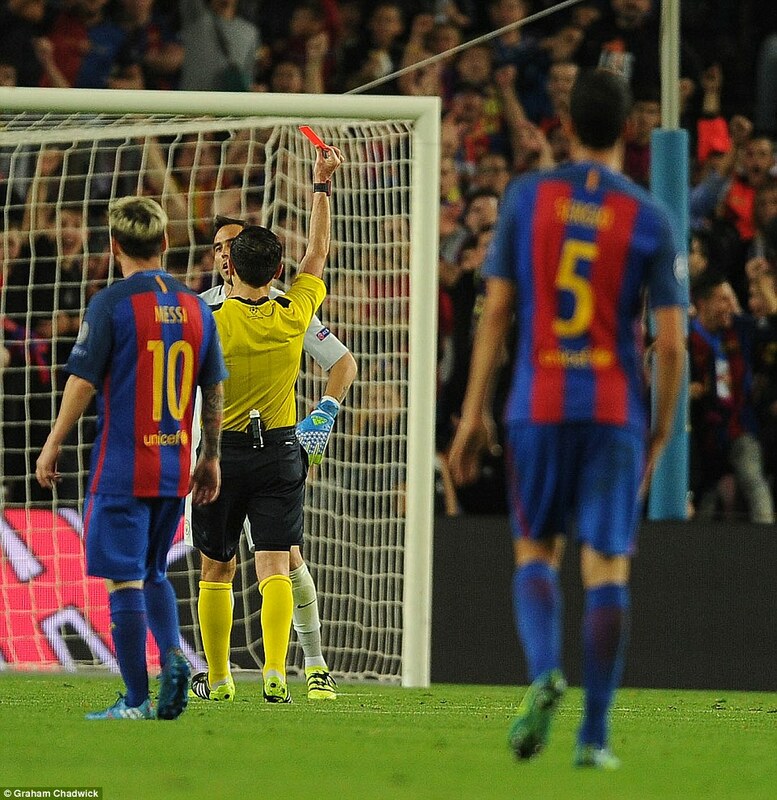 It was a horror moment for the former Barcelona goalkeeper. Still, the contribution of Suarez is worth noting. In chasing down what seemed a lost cause, he prevented Bravo taking a touch to control the ball. That, in turn, led to the dreadful error and the red card that essentially ended the contest. Barcelona didn’t score from the free-kick but were two ahead just after the hour. De Bruyne was hustled off the ball in his own half, the ball was fed forwards to Messi and the No 10 turned inside Aleksandar Kolarov to score from the edge of the area with his left foot. Their third was another gift. Gundogan, hitherto impressive, sent Suarez clear with a misplaced pass in the 68th minute and the Uruguayan squared for Messi to roll his hat-trick goal into an empty net. 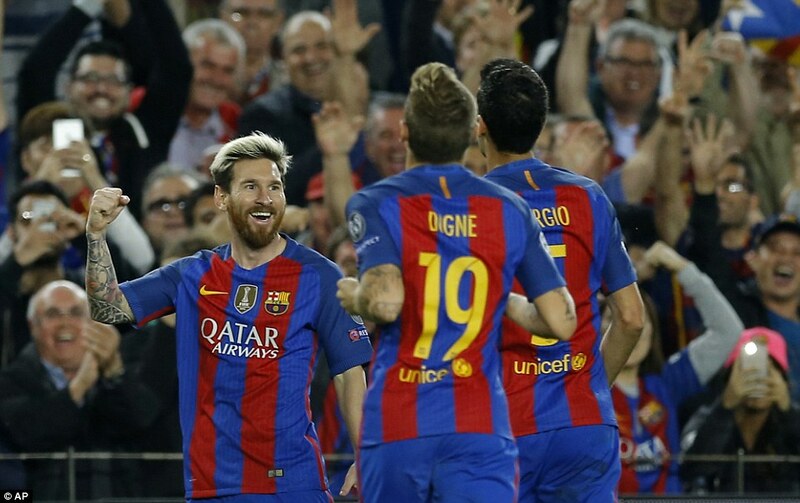 Neymar took an awful penalty, allowing Caballero to save, after Messi drew a scything foul from Kolarov in the 86th minute. But there was still time for the Brazilian to embarrass Otamendi and Stones on route to scoring his team’s fourth a couple of minutes later.